If there is one appliance that both the home owners and food service professionals in Los Angeles seem to be ignorant about, it’s the range hoods. These happen to be a very important part of the kitchen. You wouldn’t want to be working in the room without one. Yet for some reason, most people barely realize they have a range hood until it stops functioning. Than they panic. When you cook, all sorts of things roll of your stove and seep out of your oven. The purpose of your vent hood is to eliminate some of this stuff. It pulls the steam, strongest odors, and smoke you create from the kitchen, making it possible for you to breathe easily while you cook. The second the hood stops functioning the kitchen will become increasingly stuffy, until you’ll be unable to use it. The sooner you contact L.A. Fixit and make arrangements for us to repair the problem, the sooner you’ll be able to resume your culinary endeavors. Some people have tried to ignore their malfunctioning range hood and pretend it doesn’t need to be repaired, that they can learn to live without it, and so they continue to cook. If you’re currently in this position we think it’s only fair to warn you, there could be some pretty serious long term side effects you’re not going to like. You see, when you ignore the faulty range hood and continue preparing meals, the smoke, grease and odors don’t just impact your kitchen. They will spread throughout your entire home, if ignored, the smoke, grease, and smell will soak into the walls and furniture. You’ll never be able to get rid of the scent. In the future, should you decide to sell your home, the lingering odor could be a turn off to prospective buyers. The buildup could prove to be as problematic as mold or cigarette smoke. In addition to potentially jeopardizing the future sale of your home, constantly inhaling the smoke and grease could take a toll on your physical health. The sooner you contact L.A. Fixit, the more you’ll minimize the long term damage a broken range hood can do to your home and health. When you contact our 24/7 customer support service it’s possible you’re going to be surprised by what you learn. Many of our clients have dragged their feet when it came to getting their vent hood repaired because they were worried about the expense. They were surprised when the cost wasn’t nearly as bad as they thought it would be. That’s because we love our clients and want to take care of them and make sure they never fear calling us about range hood repair. manufacture approved parts. We can’t justify making a repair if we’re going toing to do things properly. One of the things we wish more home owners and business owners that use their range hoods would understand is that many of the range hood repair calls we get could be avoided if the owner had simply taken the time to learn how to care for the appliance on their own. Unlike some appliances, the hood isn’t that difficult to care for and maintain. The best way to prevent problem is keeping it clean. Removing the filters from time to time and spraying them out removes the grease build up. Not only does removing the grease extend the life of the range hood, but it also reduces the odors from your kitchen. In addition regularly cleaning the range hoods you should also make arrangements for one of our highly skilled L.A. Fixit technicians come to your place about once a year and check out the unit. There might not be anything that needs to be fixed, but if there is, the tech will find it and by correcting the problem right away, you won’t have to worry about an emergency repair call. In the long run, our routine maintenance calls will save you a great deal of time, stress, and money. We want to make your life as easy as we can. That’s why L.A. Fixit has some very strict customer service policies. To begin with when you call are 24/7 customer service line you will reach a real person. No waiting around for someone to return your message. The individual who answers the phone will be knowledgeable and patient. Based on the information you provide they will be able to help diagnoses the issue you’ve encountered, and choose the appliance repair tech on staff best suited to your problem. 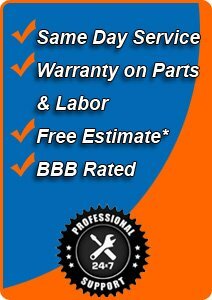 They will set up an appointment when it’s convenient for you, so you don’t have to lose an entireday work waiting for the repair professional. We can’t help with your range problems until you give us a call, and fill us in on the situation. I called these guys to come take a look at my range hood. I only had free time on the weekend and they came on Saturday. Michael was very professional. He found and fixed the problem on the spot. Great job.